A few drinks at ABAC Sundowners and then on to Eden Bar for the Texas Hold Em tournament. Played for 5 hours and eventually dipped out. Total spend ; Buy-in – $10, Beers – $5. What was more interesting is Eden’s new sign. Take a GOOD look at it. You could have cropped the photo better, say maybe to include the logo for MY BEER ! Why would I ruin a perfectly good shot by including an advert for Cambodian Yak’s piss? Is Eden Bar the same as Tahiti Eden? I is confused. No. 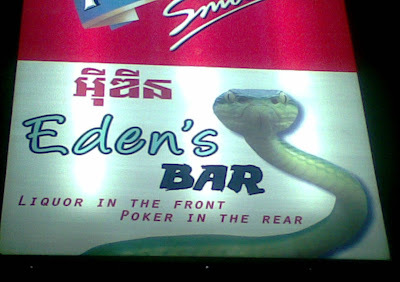 This is Eden’s bar. Eden being a little geezer. Not to be confused with that other bar of ill repute….